Unfair Park's quick-as-a-whip Robert Wilonsky, yours truly and no doubt many others got the same email Monday from NBC5 anchor Jane McGarry. "Just wanted to let you know I'm putting up a Fanpage on Facebook . . . and would love to have you as a fan," she wrote. "I need all I can get :)." But the veteran NBC5er, now co-anchoring weekday 5 and 6 p.m. newscasts with Mike Snyder, says she still can't divulge any more details "about my project :) Still working on that!" 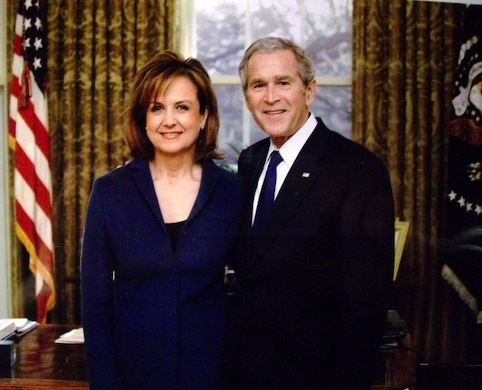 Hmm, wonder if it just might have something to do with the Bushes, one of whom is pictured above in McGarry's "Texas Journalist" photo album? Meanwhile, one of McGarry's maiden Fanpage dispatches says she's grossed out by the "breast milk cheese" being served at a New York City eatery. That's our Jane. Who can forget her classic riff on whether to shave or not to shave on NBC5's since scrapped anchor/reporter blog site? Anyway, here's a link to her newborn Fanpage, in which you also can learn that Lindsay Lohan's getting out of the fashion design business. Love that hard-hitting stuff. PROGRAMMING NOTE: Insatiable fans of ABC's The Bachelor can get another dose Wednesday morning when Dallas pilot Jake Pavelka and his fiancee, Vienna Girardi, do their first local TV interview on WFAA8's Good Morning Texas (airing at 9 a.m.). Pavelka, who's soft-shoeing over to the 10th edition of ABC's Dancing with the Stars (launching on March 22nd), also will bring along his pro dance partner, Chelsie Hightower.